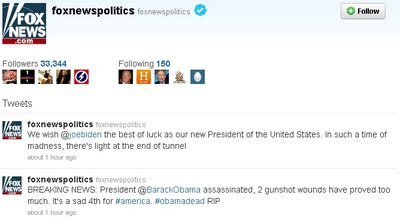 The Midnight Review: Fox News Twitter Announces Obama Assassination. Hack Or Cruel Joke? 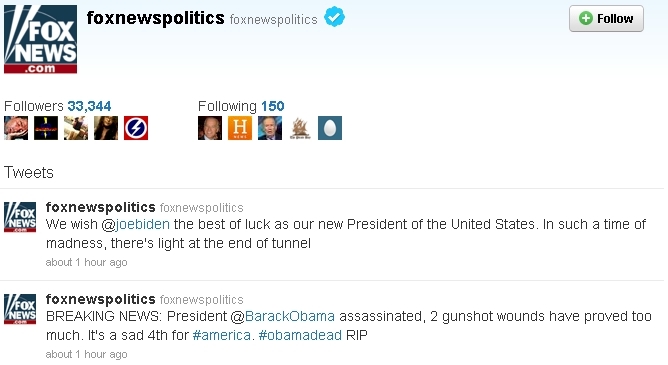 Fox News Twitter Announces Obama Assassination. Hack Or Cruel Joke? 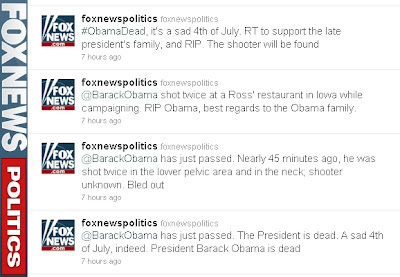 It seems that Fox News' Twitter account has either been hacked or one of their employees decided to have some fun for the holiday weekend. Considering Fox News' website makes no mention of a hack (except for this article about a hacker targeting Apple and this one for one hitting the Arizona Police), I am leaning more towards a Fox Employee, but I could be wrong. The Script Kiddie is claiming responsibility for this hack. This 'news organization' is dangerous to America, is threatening the President (again) and needs to be shut down. ASAP. And Ailes should be in jail for treason. 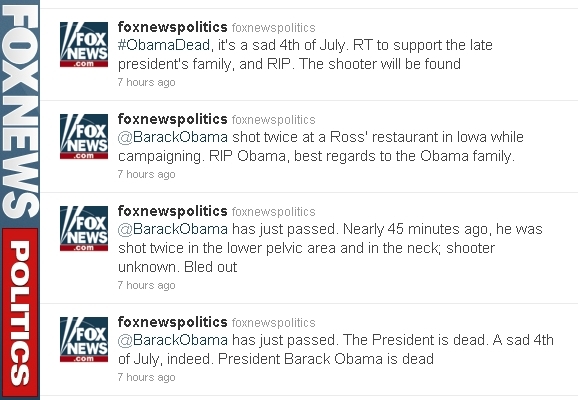 Fox News finally posted on their website that their Twitter was hacked. The Secret Service investigates ALL matters relating to threats against the President. I don't know if this would be considered a threat. Did the secret service investigate the "Death of a President" movie?